School is (ALMOST!) back in session. Learning and spending time with classmates should be enjoyable, but for many kids school leads to stress, skipping meals, heavy backpacks and poor posture. Over time, exposure to these stressors can lead to low energy, sadness, and poor health. Here are 4 things kids MUST DO to stay happy and healthy while they are at school. We’ve all heard that getting a good night’s sleep is important, but here’s why. Sleep recharges our body and our mind. Sleep regulates hormonal balance. Sleep gives our bodies a chance to repair damaged tissue. Several studies have found a correlation between sleep deprivation and decreased cognitive function. One study in particular, published in the Journal of Neuropsychiatric Disease and Treatment, found that sleep deprivation actually impaired attentiveness and short-term memory. Not only that, but prolonged sleep deprivation negatively affects long-term memory and decision-making ability. So please make sure your child gets a minimum of 7 hours each night. A recent survey in the Huffington Post found that a whopping 76% of kids come to school hungry or come without a proper lunch! Obviously this is a major problem as malnutrition in children has been linked to anxiety, learning disorders, hyperactivity, and low self-esteem. Poor eating habits can also lead to many health illnesses like diabetes, GI disorders, and future cardiovascular problems. So not only is it important to send your child to school with a lunch, but make sure it’s low in added sugars and chemical additives (which have also been shown to negatively impact a child’s health and development). Our bodies were meant to move, not to sit hunched over in a chair for 7+ hours per day. In Ontario, some schools are beginning to switch over to standing workstations in the classroom. If your child still works at a sitting desk, then ensure they get up and move every 60 minutes at least! Movement is good for our joints and encourages proper growth and development of our bones and muscles. If you need to sit, then try to sit with your knees, hips, and elbows all at 90 degrees - don't slouch! When a child carries too much weight or does not carry it properly, it places an abnormal amount of stress on the spinal bones, discs, and nerves. This stress leads to poor posture, poor spinal development, and can eventually cause pain and dysfunction in your child’s developing body. 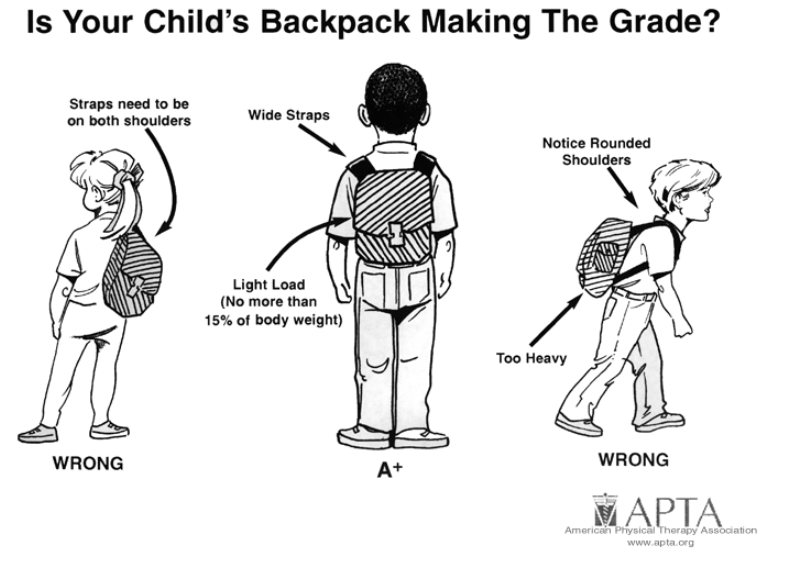 When using a backpack make sure your child does the following: use both straps over both shoulders (the wider the better), carry no more than 15% of their body weight, evenly distribute weight through the different compartments, and ensure that the pack does NOT sit lower than 4 inches below their waistline. According to the US Consumer Product Safety Commission, more than 14,000 children are injured annually from backpack related injuries, with more than 5,000 children ending up in the emergency room. While not every child who carries a backpack will end up in the ER, carrying a backpack that is too heavy, especially if not carried properly, can lead to a structural shift of your child’s spine- causing things like scoliosis, severe neck and back pain, shoulder pain, and headaches. Pain like this in a school aged child can lead to an inability to sit still for extended periods of time and decreased ability to concentrate. If you child is experiencing any of the above signs and symptoms, make sure they are evaluated for structural shifts of their spine by a licensed chiropractor to ensure that no residual problems develop down the road. Neuropsychiatr Dis Treat. 2007 Oct; 3(5): 553–567. American Physical Therapy Association.